Gold Coast, Queensland: Ford and Holden fans will put their pocketbooks where their passion is on the 21st October, in a landmark bidding battle for more than $10M worth of classic cars at Lloyds Auctioneers and Valuers. Held onsite at the auction house’s Gold Coast premises, the event will see Australia’s longstanding Red vs Blue racetrack rivalry play out in a showdown of epic proportions, giving diehard fans the chance to bid on a range of rare and historically significant cars, with all lots starting at just $1. Total sales for the series’ 100+ lots are expected to exceed $10M, with the first auction to include two genuine Bathurst raced cars – a Holden GTS 350 HT Monaro and Ford Falcon XY GTHO Phase III – as well as an all original 1970 Ford XW GTHO Phase II. Coinciding with both the Vodafone Gold Coast 600 and closure of Holden’s South Australian production facility, auctioneer Bill Freeman says the event is designed to give fans a fitting way to celebrate Australia’s rich automotive heritage. “It’s a bittersweet month for Australian motoring, so to remember Holden and Ford’s finest moments, we’ve sourced classics from the cream of each brand’s crop, in a collection that will excite any Red or Blue enthusiast,” Mr Freeman said. This includes the GTHO Phase III Ford Falcon, which is of particular note due to its dramatic race at 1971’s Bathurst Hardie-Ferodo 500. With legendary dirt track racer Garry Rush and open-wheel ace Damon Beck behind the wheel, the GTHO was ahead of Peter Brock and looked set to finish in around eighth place. That was at least, until the wheel’s hub broke away from its rim on lap 117 of 130, representing a crushing loss for both drivers and team. Sporting one of around 20 ‘Quality Control’ 351ci Cleveland engines ever built by Ford specifically for dealers to use in ‘The Great Race’, this genuine and verified XY GTHO Phase III, is as desirable for the rarity of its QC engine being in place, as the provenance of its racing history. 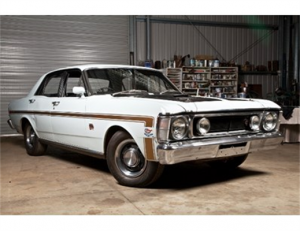 Also up for auction on the day is a Holden GTS 350 HT Monaro, which was raced at the 1969 Bathurst 500, by noted motoring journalist and race driver Bill Tuckey. Mr Freeman said his team is passionate about sourcing the country’s greatest classic cars to offer to motoring enthusiasts, “We’re relentless about hunting down Australia’s rarest and most collectable cars. The first live auction will take place on Saturday, 21st October, at Lloyds Auctioneers and Valuers, 69 Manchester Road Carrara, from 12:00 noon.